I love your red rooms! My diningroom was red in my old house, LaFonda Geranium. Loved saying that name! With white below the chair rail. I even had that same floral print and had hydrangeas on top of my hutch. I kid you not! I love those swing arm rods you found. I have never had much luck with ebay. I don't have patience with the bidding. I should try more because I see a lot of people find good things. And I also love your use for the shutters and those slip covered chairs! its gorgeous!!! I am not a red person...but..omg, I can't belive how beautiful it is...I love it, great job, so much inspiration! Fun stuff, Miss Leslie! :) I am going to email you pictures from our last house. I don't think you were ever there. 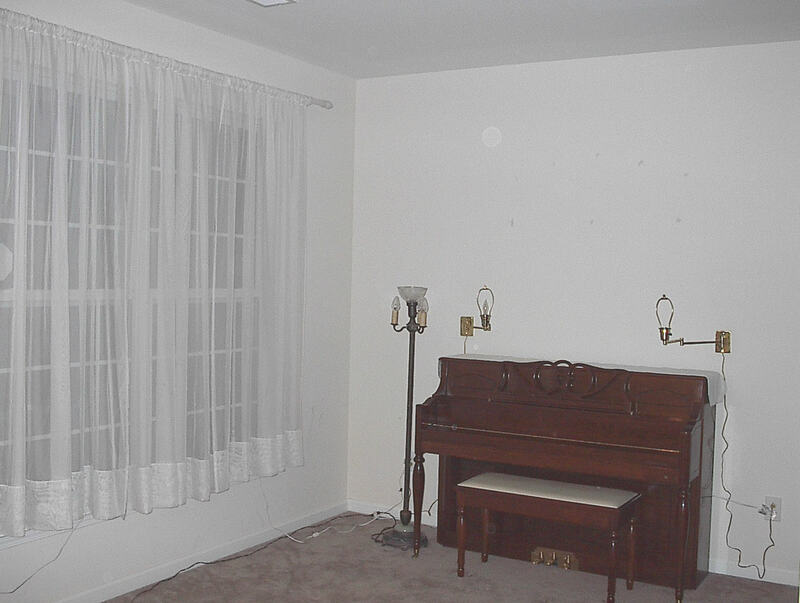 :( Just thought you'd like to see the red kitchen... our piano was very similar to yours as well! I am soooo loving your re-do's!!!! You are a very frugal and crafty (in the good way) woman! You give me inspiration! 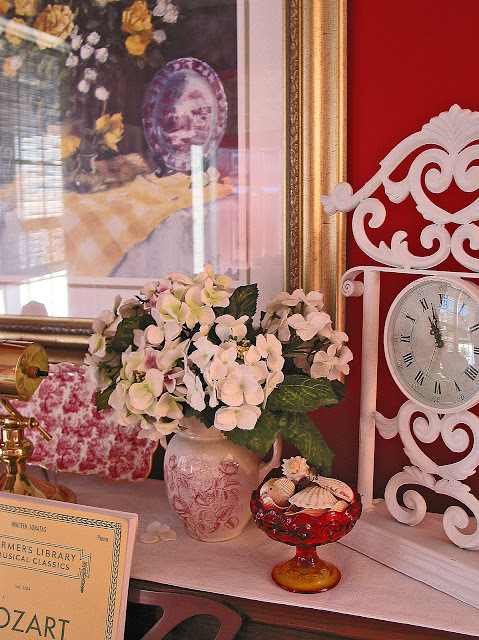 Leslie, thanks for this wonderful look into your home. I love the red of course and now I see your drapes like mine. Of course I didn't make mine. Love the swing arm rods. 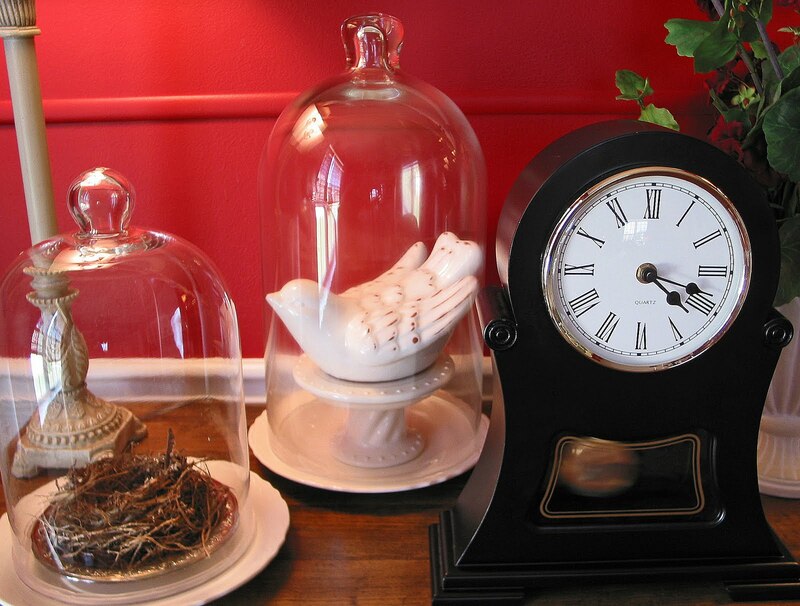 I love fake flowers, too and I sure hope the bird in the cloche is fake or it will be soon! I got so tickled when you said it was fake, too. You have a beautiful home. 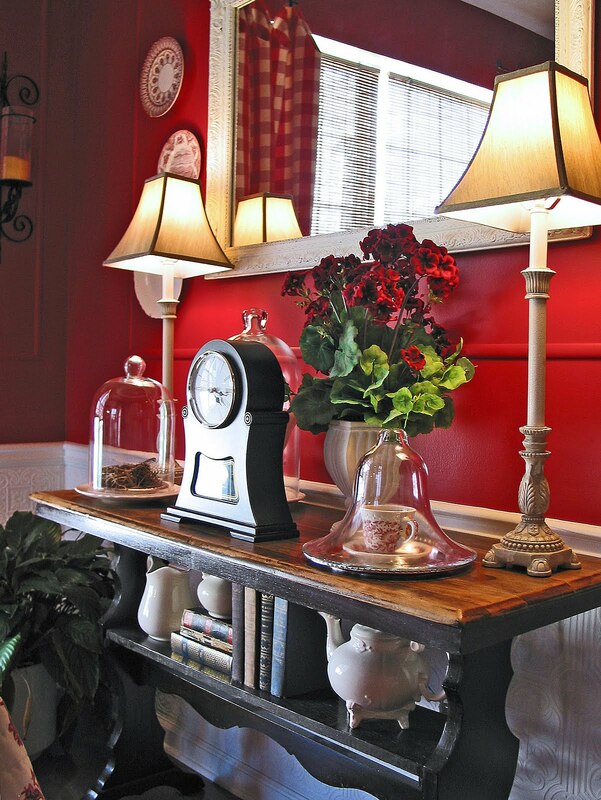 Loving all that red and what great antiques. Very nice! Now I'm just waiting to see what you named your hutch???? And I love every inch of it! I have only one red room in my entire house. Odd, really, since I always love it. 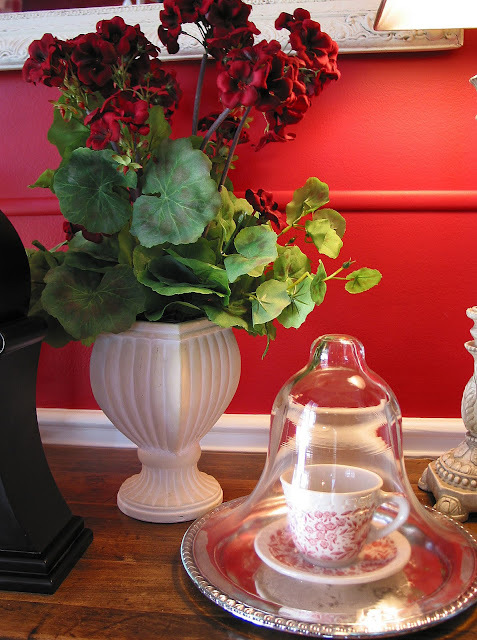 I am determined to redo our kitchen with red, and soon. It will just be such an enormous project that I am still saving money toward it. We're pay with cash folks too. But I digress... I love your tour and think that you did a stunning job on those spaces. I can't single out a favorite, but one of my favorite parts was the swing out rod with the checks. This is wonderful! I love all the red and your slipcovers are amazing. I have to go back now and scrutinize every square inch! Great ideas to copy! I love antiques, goodwill and garage sale finds too. My whole house, like yours, is thrift and hand-me-downs. It makes for such an interesting decor. Thanks for showing us! I'll be over here, cleaning the cushion on one of your chairs. ; ) I like red and white together like this; you were very brave to do it in wallpaper and paint! You're so talented Leslie to make all the slipcovers. Sooooo PRETTY in RED!!!! Luv those drapes and that THRIFTY light fixture! Everything looks so nice Leslie! 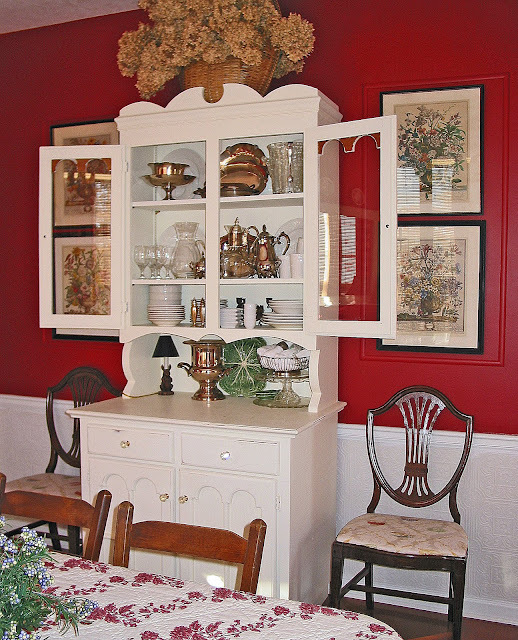 I love the red especially the toile. 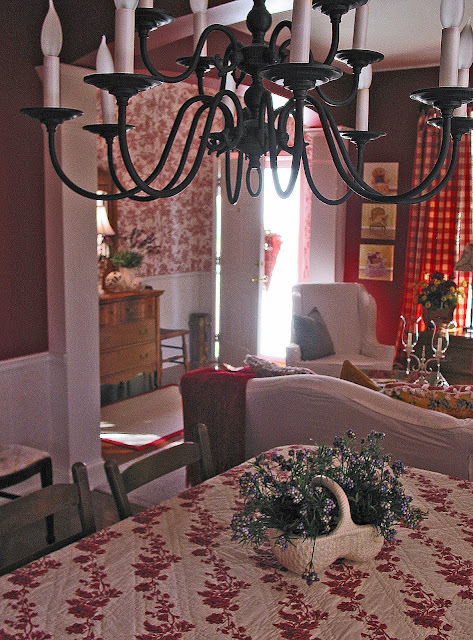 Wow, that red toile is swoony!!! If you had to wallpaper for eternity, I would spend eternity scrubbing and scrubbing and never getting paint off my hands and out of my hair! Oh my goodness! You did A TON of work! And it shows -- your house is amazing! Great job! 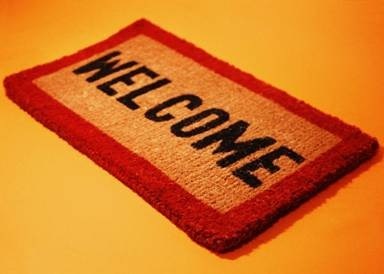 Your home is lovely! I love all the red, you'd think it would be invigorating but it seems calming to me. 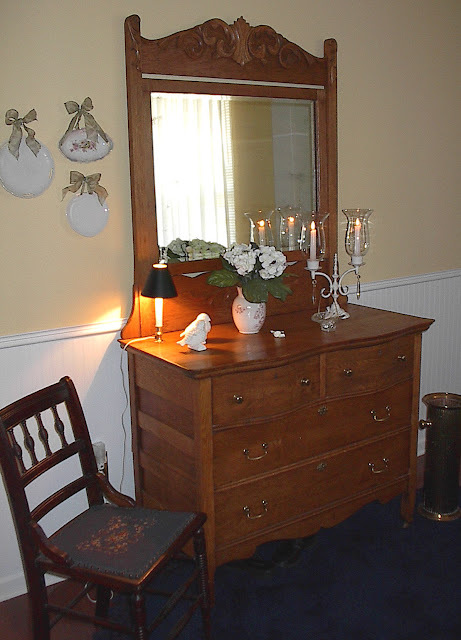 Great job and what a blessing to "inherit" 28 pieces of antique furniture! I love all the red. It is so bright and lively. Great job. I can't wait to see the kitchen. More red? Wow, Leslie. It's just stunning! All of your hard work with the wallpaper has really paid off. It's gorgeous. I love that hutch. Everything is beautiful. Wow! It is so beautiful! You really did a lovely job. Everything looks great! I do love the wallpaper!! It was worth all the work....it's beautiful! I like all your thrifty finds! Hope you had a great day at Hobby Lobby (I went back a second time)!! Can't wait to see the kitchen. 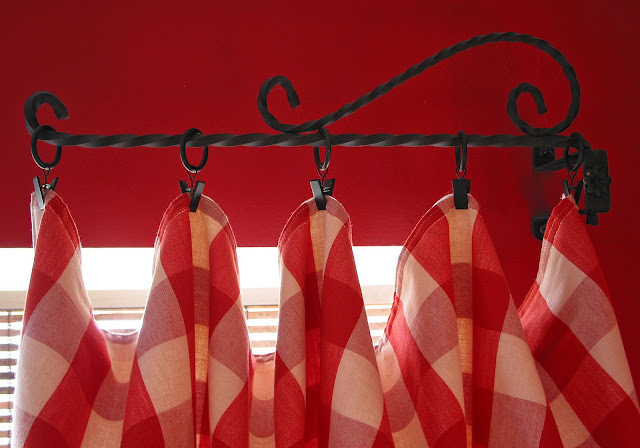 Red is my favorite color, so I fell in love with your home...the swing curtain rods are fabulous...I searched for those about a year ago and finally just took a rod and cut it short to improvise - I love yours! The white orbs on your table are very cool...I enjoyed the tour! The red looks great and loving the wall paper! You have a great talent of pulling it all together! Looks beautiful! Were these chairs on RMS? They look so familiar??? I just remember 2 white matlasse wing chairs from there. If they're the same ones...I've never forgotten them. And still plan to try this. I have 2 sisters in Greenville. Do you remember kiakai from RMS? OMG! Everything looks absolutely GORGEOUS!!! What a beautiful space. Although you don't like hanging it, it sure looks great! I am hosting a giveaway and I'd love it if you stopped by! Leslie, everything looks so lovely and inviting! I love red, too. Have it in our dining room. Don't you find it fun and so easy to decorate with? Love your artwork and the drapes. Love it all! I love all that you have done!!! Love the wallpaper!! love the reds! Love the slipcover (I need some badly!!) 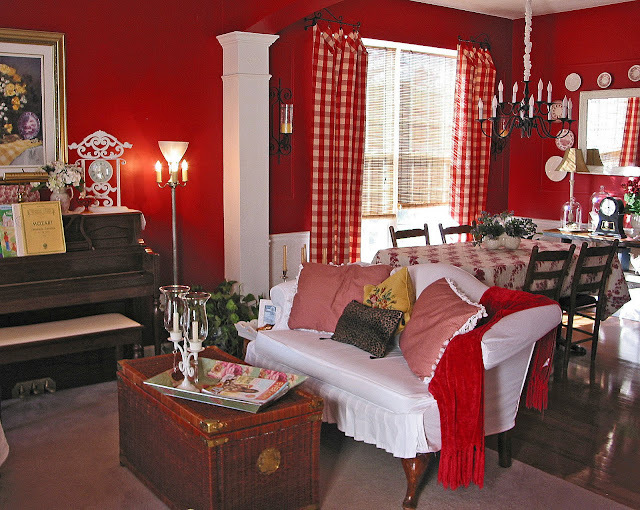 One of my living rooms used to be red. I did love it....but after a while I wanted a lighter color....at night it seemed a bit to dark in that room . Love yours--very inviting!! Your house makes it so much fun for me to go along on the tour! The red is stunning. Love all of your ideas! OMGosh...were you ever on Rate My Space? I think I've seen your rooms there?? ANYway, your home is just outstanding. I love the color RED and you REALLY know how to do it up right. Just stunning. I am your newest stalker...uhhh...follower..Hope you'll come see me soon. I surely will be back here. Yeah! Another red lover! I adore your use of color...bold color! I love your rooms and all of the beautiful things you have filling them! Simply beautiful! Today I gave you an award! 3rd attempt at commenting! -silly internet is acting up tonight! I love how you transformed these plain spaces into such a cosy welcoming environment! Lovely work. Thanks so much for showing us more of your charming home! Those are beautiful rooms! 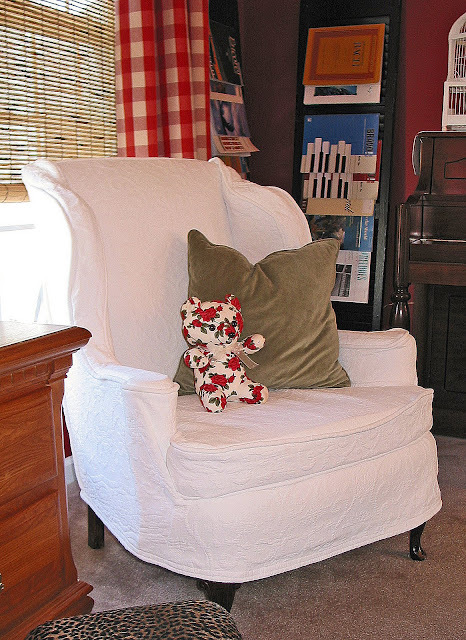 You've used my favorite color (red) and I LOVE toile. 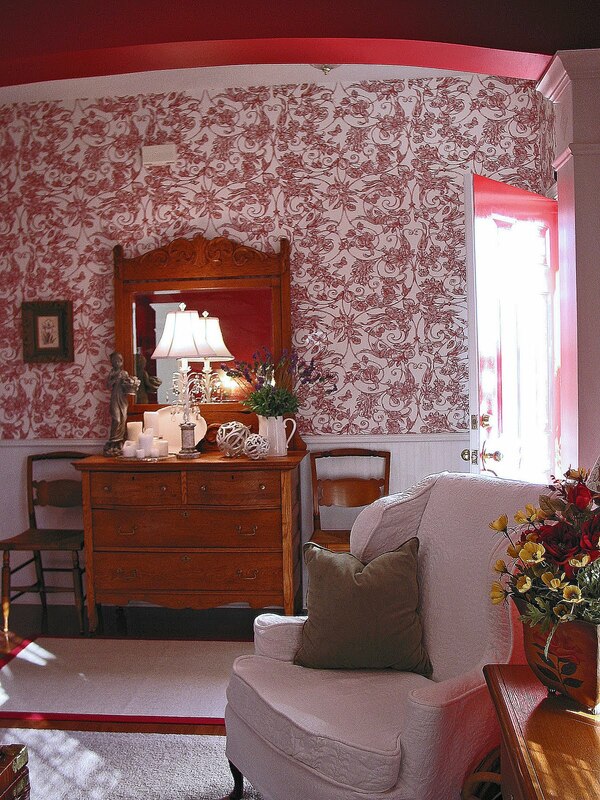 That toile wallpaper looks so great with the white wainscoting! Love the red buffalo check curtains!! Gor-ge-ous! 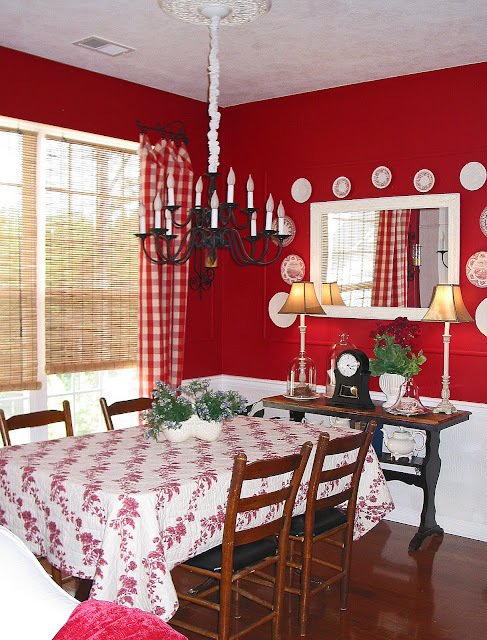 LOVE the red....that dining room is spectacular! Your house is truly gorgeous. You have really done an amazing job-you must feel so happy when you look at all of these before and after shots. I hope for your sake that you never EVER have to wall paper again-poor thing!! I love the red walls! 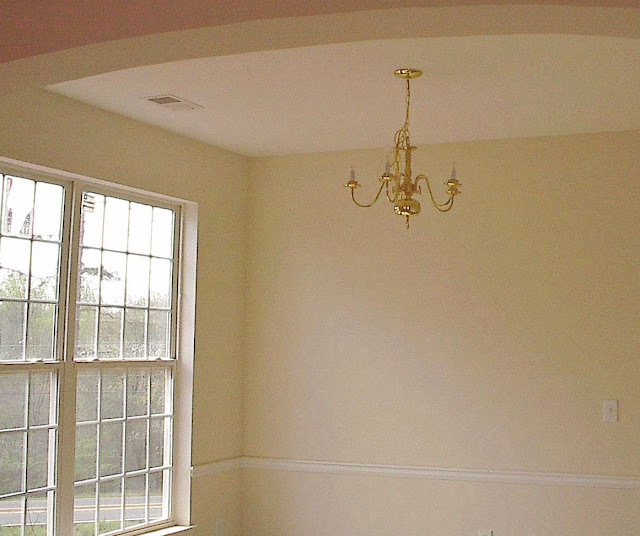 And I love the high ceilings. Amazing! WOW your bold choice of reds is fantastic! I love color, and this one is one I feel I do not use enough. You have really done it well....Thanks Leslie for your comment and your support...I always wish you the best care and service possible at Walgreens. My husbands has worked in Greenville numerous times for OT. Wow! I love these rooms. So bold but pretty too. How wonderful to get all those antiques. You've done a great job of making it all feel fresh. Your home is as beautiful as the woman of the house! I love red. We have a red room in the Fairfield House. I feel your pain -- we applied 5 or 6 coats plus primer. Your red toile paper is stunning. 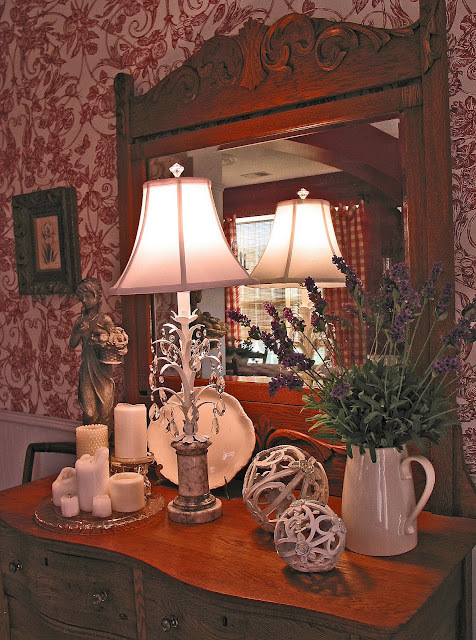 Stunning job incorporating your antiques. Breath-taking! These pics look like they're right out of a magazine. I absolutely LOVE it! Wish you could do my house next! :) Makes me feel like redecorating! First,the toile wallpaper makes a tremendous difference in the bedroom - the room just pops because of it! I am so tickled with all your sewing and painting and finish work. I am so itching to see the kitchen! Everything looks so wonderful - you must be so proud of yourself! make that work as well as you did. You certainly have created a warm and inviting home. Absolutely beautiful! You scored some great deals too. I just love a red room. I'm going to feature this on the PoPP Spotlight on Saturday. What a beautiful home! I love the red! This is my 1st time visiting... love the name of your blog! Wow Leslie, Your rooms are so inviting and warm..
what am I saying, they are red hot! That wallpaper is gorgeous, but naw-uh, no way, nope, have no patience. Snails, butterflies?!?! tryin to match up the pattern?! They'd be puittinme back in a little white room LOL. So behind on reading blogs. I just have to tell you that this is breath taking. I love the red. I don't do wall paper as I am terrified how it will turn out, but yours is ah-may-ZING! Ooh-la-la, I'm lovin' me some red:) Great job! 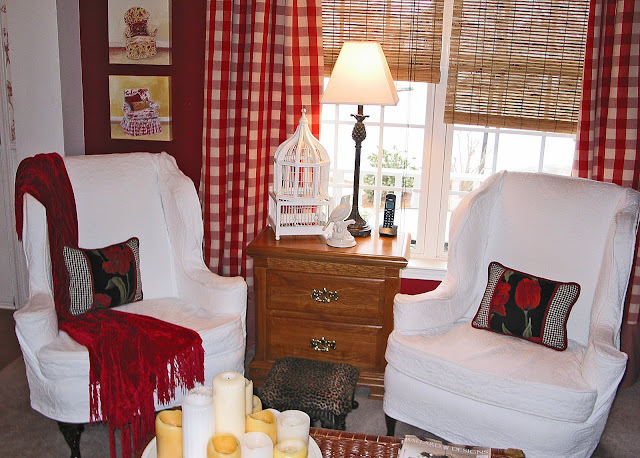 You should stop by on Monday for my "Restyle Your World" linky party! I *LOVE* all the red! It is just gorgeous! 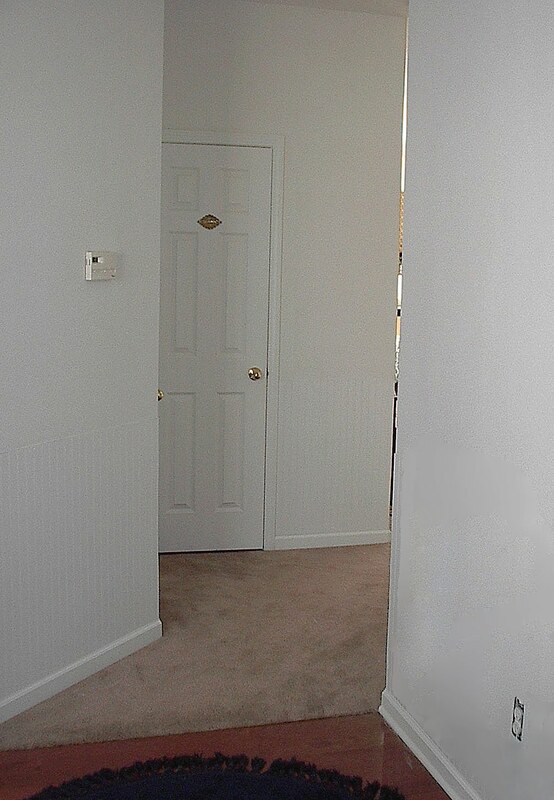 OMG your room and foyer are gorgeous!! Loving it! Amazing how well you put together a room with such BOLD RED...great job! and...I love the lamps everywhere. My daughter loves a good can of spray paint..ie: your chandelier etc. She does the same with wonderful results. Beyond gorgeous once again, you are great!!!! I can't believe I had never noticed your wallpaper. Or maybe I have and I forgot. Seems to be happening quite often these days. LOVE the paper. Leslie, I could literally get lost in your home. that is way too costly apparently. I would like to know the property prices in ascending order.